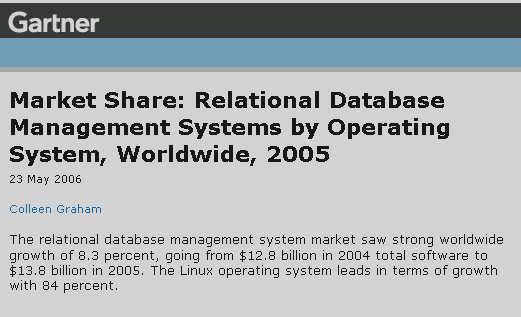 Two reports, one by IDC titled "IDC Reveals Steady Growth for Worldwide RDBMS Market as Top 5 Vendors Hold Their Positions" (link to news release), and the other by Gartner titled "Gartner Says Worldwide Relational Database Market Increased 8 Percent in 2005" (link to press release) state the same thing: Oracle continues to be the No.1 DBMS vendor but also exhibits the strongest dollar growth among all vendors. 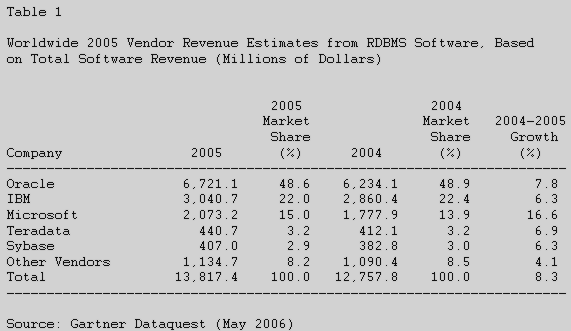 "There were no changes among the top 5 RDBMS vendors from 2004 to 2005, with Oracle capturing top honors with 44.6% of the worldwide market. Oracle was followed by IBM with 21.4% market share, and ranked third was Microsoft with 16.8% market share. Rounding out the top 5 were Sybase and NCR Teradata, with 3.5% and 2.9% market share, respectively. 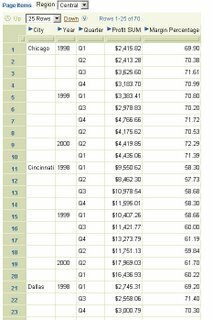 Microsoft experienced the strongest year-over-year growth on a percentage basis, and Oracle the strongest growth on a whole dollar basis in 2005." 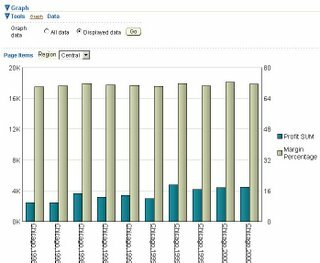 The IDC report is titled "Worldwide RDBMS 2005 Vendor Shares: Preliminary Results for the Top 5 Vendors Show Continued Growth (IDC #201692)". "Gartner Dataquest's Software research group has traditionally measured market share in terms of new license revenue. 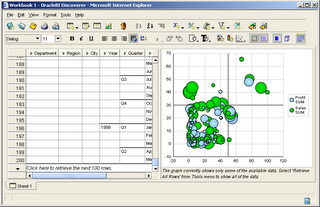 However, due to the emergence and increasing popularity of open-source software and buyer consumption models such as hosted and subscription offerings, Gartner has moved to measure market share in terms of total software revenue which includes revenue generated from new license, updates, subscriptions and hosting, technical support and maintenance. Professional services and hardware revenue are not included in total software revenue." Is there a memory leak? After spending most of the morning and afternoon using Firefox (for work related research mind you!) 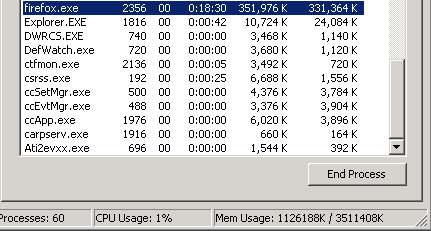 and opening and closing tens and tens of sites in new tabs, closing tabs, downloading documents, etc... the Firefox.exe process shows up as using in excess of 300MB of memory!! 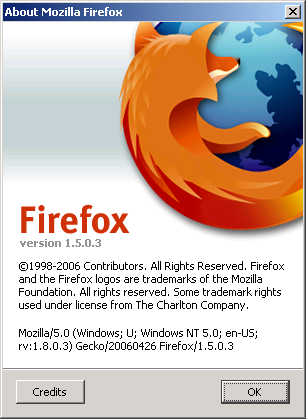 BTW I am running Firefox on a Windows 2000 SP4 machine. 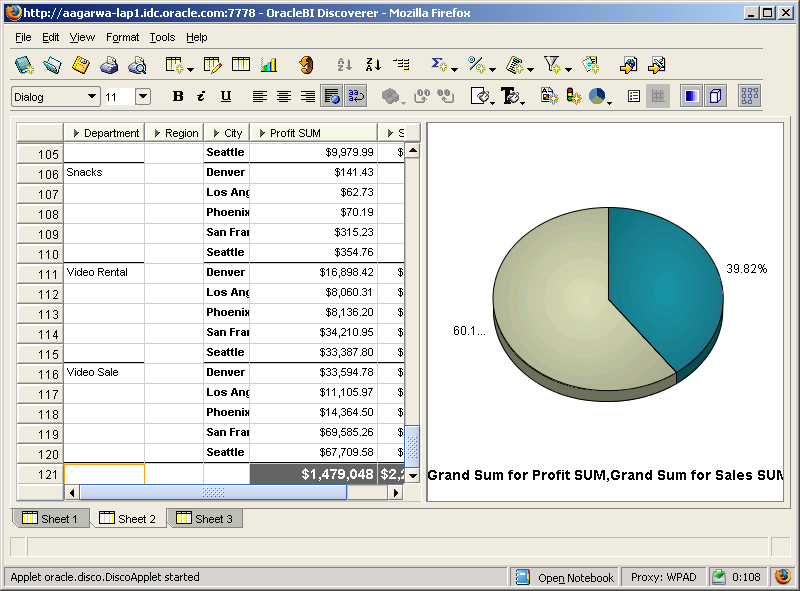 Though Oracle will launch the next release of Oracle Warehouse Builder 10gR2 (version 10.2.0.1, codenamed 'Paris') at the ODTUG Kaleidoscope 2006 conference, June 17-21 2006 (link) (also see my earlier posts on ODTUG 2006 - here and here), it is available for download from OTN today. It has been certified on and is available on seven platforms initially; other platform support will follow. 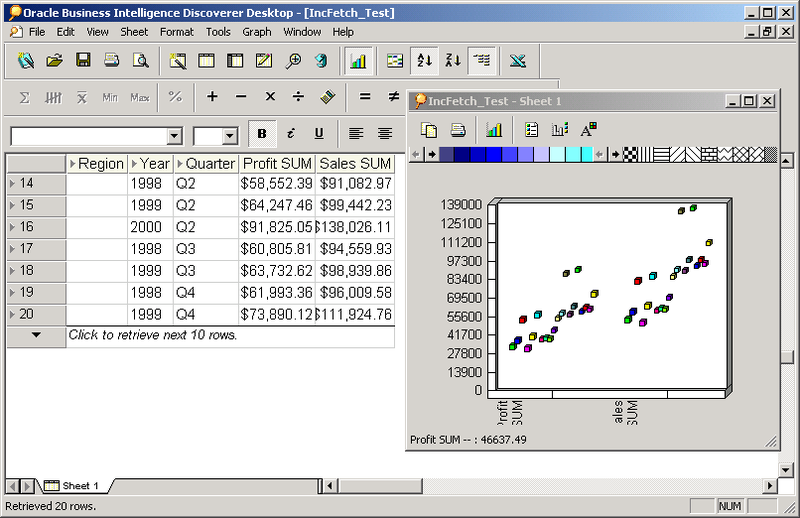 "What do we get when we combine the power of SQL with advanced analytics? The answer: a revolution. 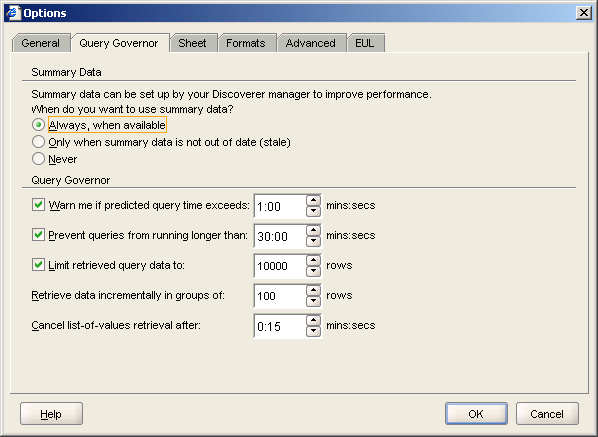 The Oracle RDBMS has added, over recent releases, support for advanced analytics to the SQL vocabulary..."
Follow this link for the full post. In my last post (Incremental Fetch for Graphs) I talked about how incremental data fetch for tables now works for graphs also. 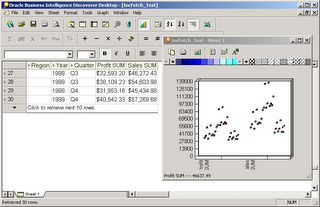 What I forgot to add was how this behavior works for totals only graphs. In my graph options I now change my plotting option from "Data only" to "Totals only". 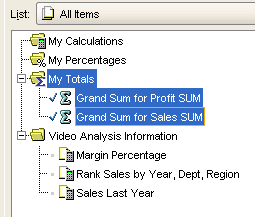 And I have two totals defined - one for each of my data points: Profit SUM and Sales SUM. 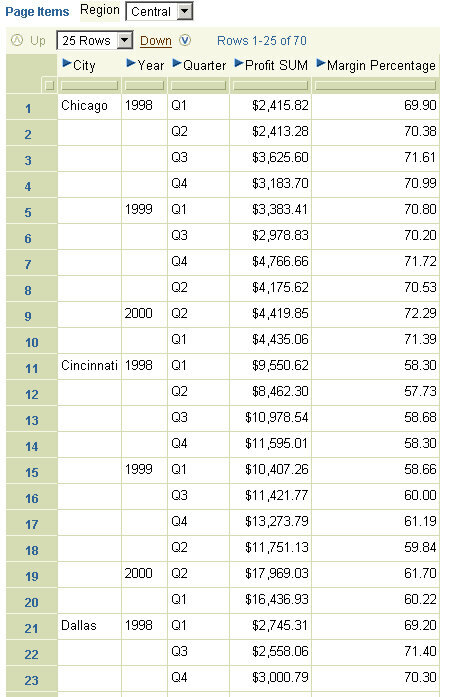 These are grand totals, so that they will display only once at the end of the table. And of course, I have my incremental fetch value set to 50 rows, so that when I run my worksheet it fetches only the first 50 rows of data. 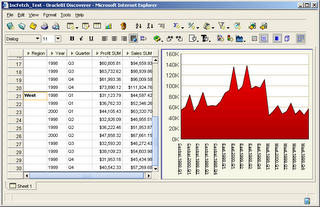 The graph does not display any... well.. graph... because the totals have not yet been displayed. 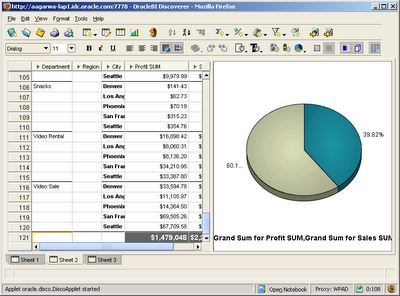 If I retrieve all rows into the worksheet, I get to see my totals at the end of the table, and the graph now shows a pie chart, with one slice for the Profit SUM total and the other slice for the Sales SUM total. This is a small yet useful feature that was introduced in Discoverer 10.1.2 - for long tables where incremental fetches are performed for fetching data into Discoverer Plus, the graph now stays in synch with the table data. The premise is straightforward - there is an option that allows the user to specify how many rows of data should be fetched in each increment. 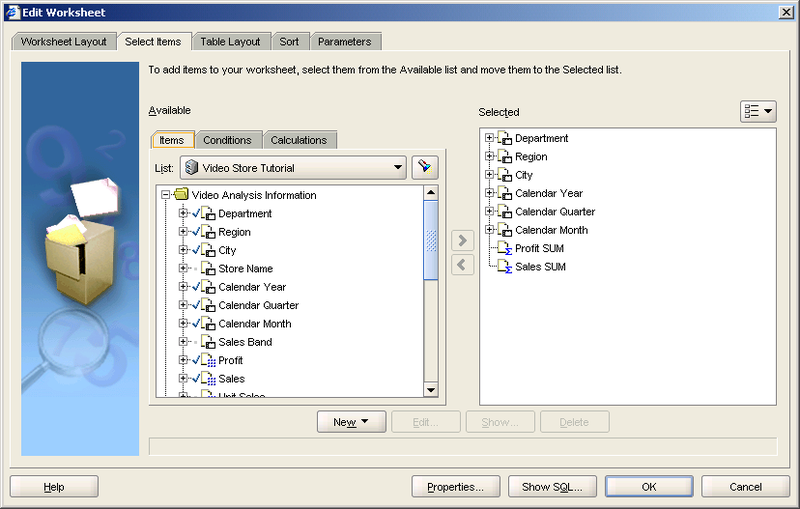 For long tables this helps in getting the data to the user quickly. 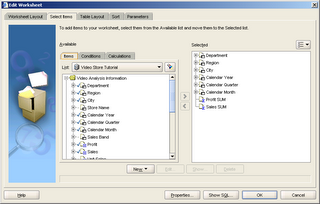 The user always has the option of using the Tools --> Retrieve All Rows option to fetch all data into the worksheet. Taking an example below, I have created a table with no page items (this is important, because when you specify page-items, performance benefits of incremental data fetch are lost), and specified that data should be retrieved in increments of 100 rows. My table will return more than a thousand rows of data, so this illustrates the concept nicely. Notice in the screenshot below two things - only the first 100 rows of data have been fetched. There is a line at the end of the table that says "Click here to retrieve the next 100 rows.". 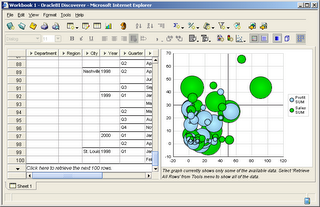 The graph window similarly has a message that says "The graph currently shows only some of the available data. 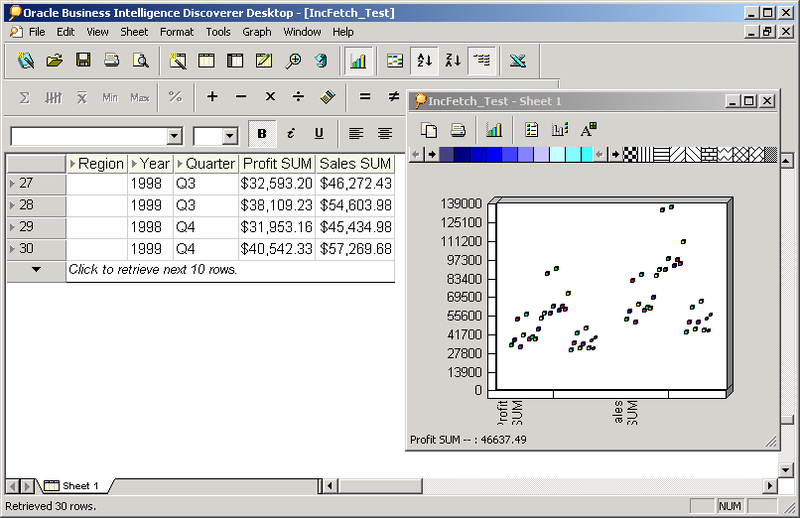 Select 'Retrieve All Rows' from Tools menu to show all of the data." 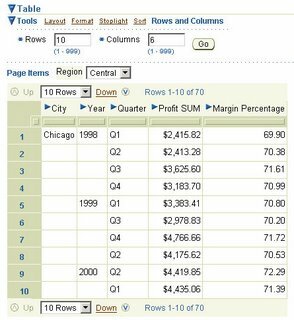 If you click the row at the end of the table, the next 100 rows are fetched, and the graph (bubble graph) updates to now show 200 data points. 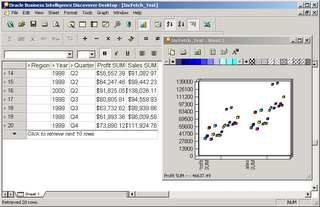 And I can continue doing this till all rows of data are fetched into the worksheet. When no more rows of data are left to be fetched, the message no longer appears. 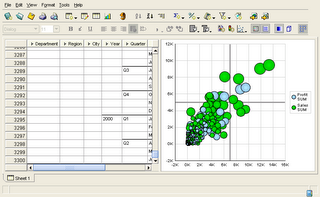 This is another example, but with a smaller dataset and a different graph type (area graph). 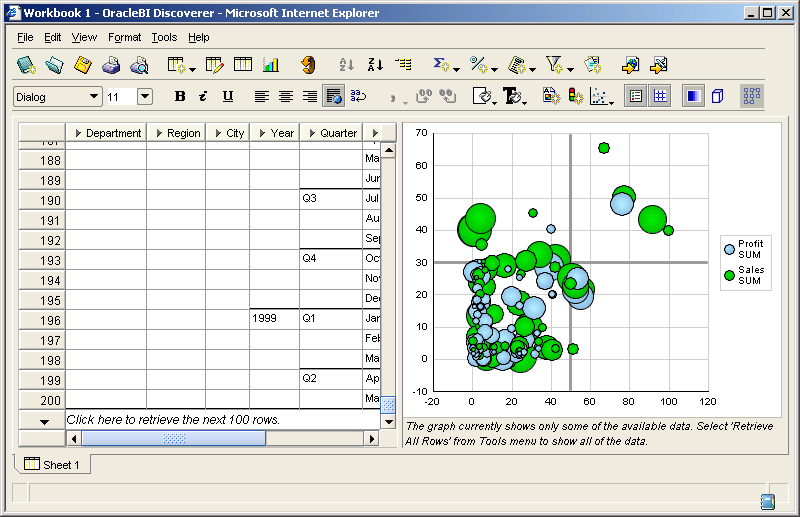 Discoverer Desktop had this capability in earlier versions also, but this was added to Plus in 10.1.2. 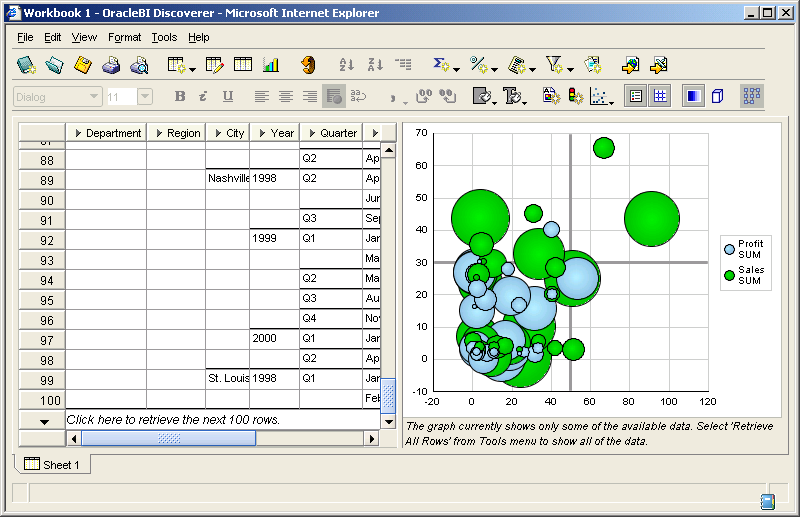 There may be others where Discoverer may be shown or discussed... The BI Roadmap presentation by Christina for one will cover Discoverer and how it fits in with the different BI editons that Oracle announced - Standard Edition One, Standard Edition, and Enterprise Edition. ODTUG Kaleidoscope 2006 (link) is happening at the Wardman Park Mariott in Washington DC from June 17-21 next month (June is the next month after May... so that was a bit tautological). To get a list of all BI presentations you have to see both the "BI Summit" and "BI/DW" options from the dropdown on the page (link to the ODTUG Kaleidoscope 2006 page, and link to the Schedule-at-a-glance PDF). Mark Rittman shall be posting I am sure, as shall Michael Armstrong-Smith too I hope. 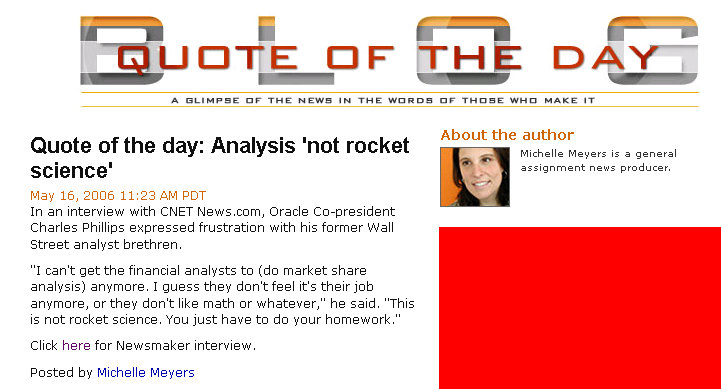 I have a post on portlets sitting in my drafts folder for over two weeks now - I need a couple of screenshots, so I hope to post it in the next day or two - but here is a news item about Oracle's President Charles Phillips statement about his being unable to "... get the financial analysts to (do market share analysis) anymore." that is likely to get lots of eyeballs (in part because it has been featured as a Google web clip on Gmail and as a "Blog quote of the day" in C|Net - link). 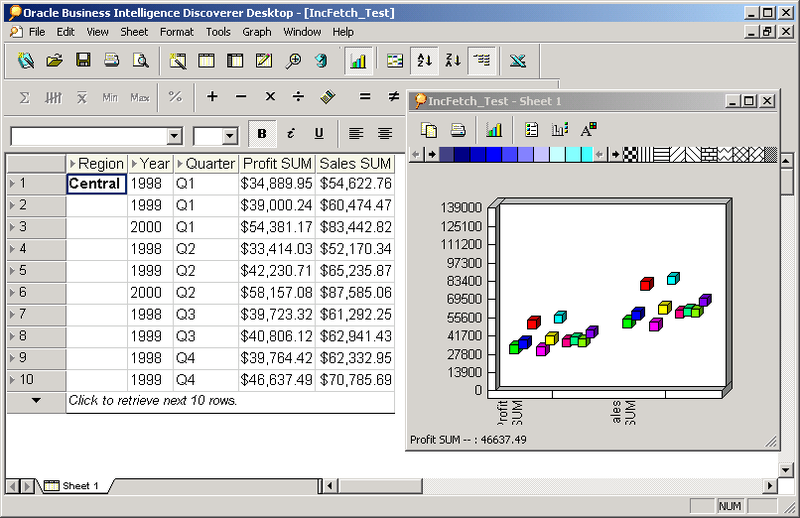 There are two articles in Intelligent Enterprise (link to site) by Ventana Research (link to VentanaResearch web site), one labelled a Ventana QuickTake™, and the other VentanaMonitor™, on Oracle's BI suite and strategy. 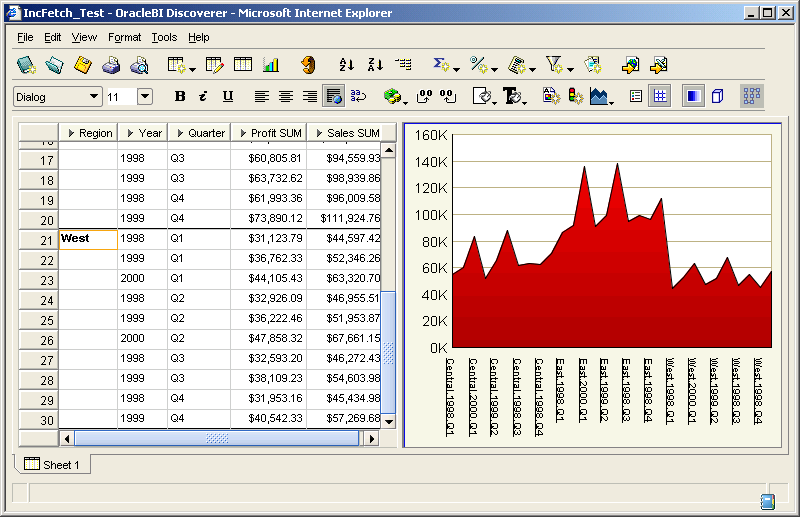 "Oracle is an embryonic stage in its adoption of BI as a strategic component of the overall business. Nonetheless, this could become a significant element of its business and deliver sophisticated technology for enabling companies to manage their performance." 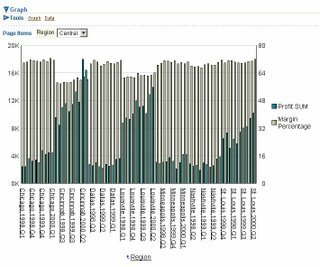 And, finally, on a slightly different note, Mark Rittman (link to blog) has posted a detailed introduction to the Enterprise Edition of Oracle Business Intelligence (see post, "An Guide to OracleBI Suite Enterprise Edition"). Correction: I hit the wrong combination of keystrokes and the post published prematurely. Completed a sentence that had been left dangling. This is (also) not a BI post in any way - stop reading if you are not interested. I shall be in the US next week, first to Oracle's headquarters at Redwood Shores, then a short one day halt at Burlington, MA, and then back to India. I shall also get to meet at least some of the Siebel Analytic people there (I met a few here in Bangalore a couple of weeks back). Don't know how much I shall be able to blog, but I shall certainly take lots of photos to post when I am back. That is a grand total of 57 hours and 20 minutes of flying and waiting at airports, about 30,000 kms, all over the course of a little over 8 days, and all in the uncomparable luxury of economy class (mind you this is still better than flying between Milwaukee and Seattle every week, or between Tampa and Seattle that I did a few years back for the better part of the year). At least it is better than the standing room future that Airbus has been supposedly pitching to Asian airlines (read the story and the subsequent denial). Looking at this photo and this one, I shouldn't really be complaining though; there are more 'compressed' ways of commuting. This is not a business intelligence post, but this is still such a nice article on a customer success story that I had to blog this. 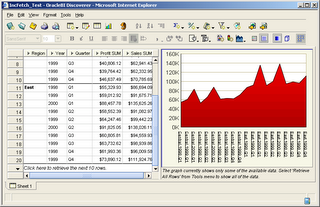 In 2004, the company’s 13TB data warehouse was spread across five Microsoft SQL Server 2000 databases. But within a year, the fast-growing firm’s database had grown to 30TB spread across eight instances of SQL Server 2000. Microsoft treated Helle well, putting NextAction into a special program for extremely large databases that included plenty of support. But within two weeks, the results were clear to Helle. 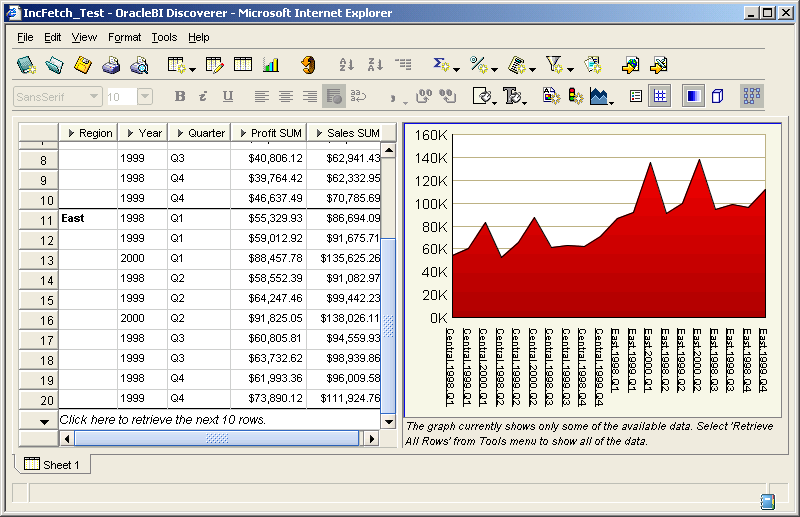 “SQL Server has made great strides in the past couple of years. 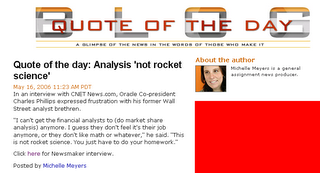 But like I told the Microsoft guys, it’s hard to match [Oracle’s] 15 years of evolution,” he said. An updating statement that died after 1.5 days on SQL Server without completing took one hour and 10 minutes to finish on Oracle. That 30TB database was shrunk to just 5TB after being rewritten -- and it was moved to one Oracle instance from eight. There is a very positive article on Oracle's BI product strategy announcement (link to video on Oracle.com) titled "Oracle set to become probably the most important player in the BI market" (link to article), written by David Norris (link to profile page), Associate Analyst with Bloor Research. "...after the acquisition of Siebel, Oracle have started to merge their product lines, and the resultant solution set is very exciting." "With the acquisition of Siebel Oracle find themselves as the owners of one of the most exciting BI solutions available at present." "...Oracle is taking BI very seriously, and this new found enthusiasm is being backed by significant investment and the creation of a very complete vision to enable them to compete very aggressively in all segments of the market." What's there to not like in this article? 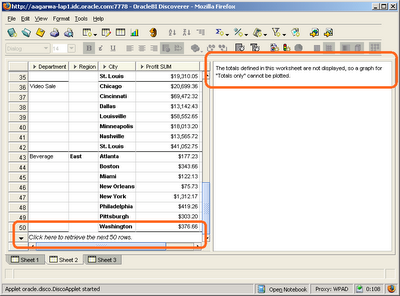 This is a little known feature in Discoverer Viewer, and was introduced in Discoverer 10.1.2. I think it is one of those wonderful little features that probably few people know about, but can be immensely useful. Take for example the table below. 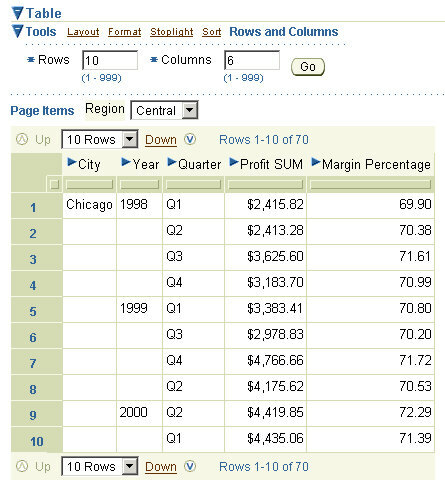 It displays Profit and Margin data for Cities, Year, and Quarter, by Region. For the given dataset this query returns 70 rows. 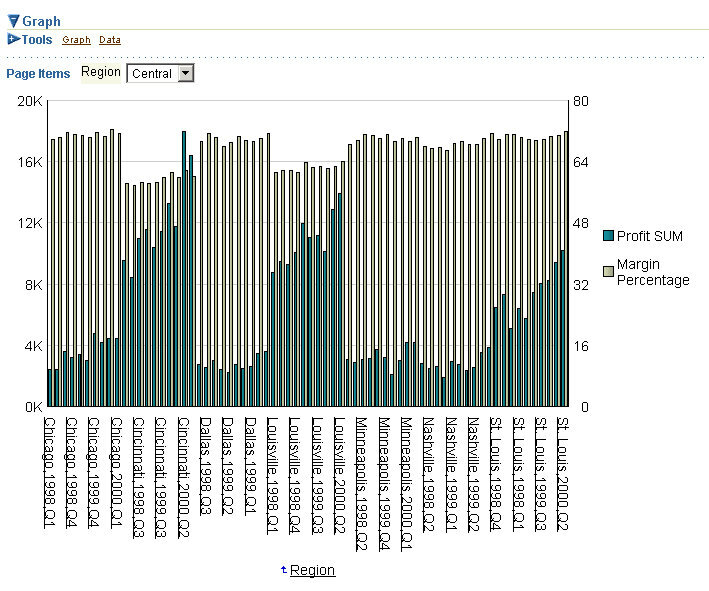 Even though I have 25 rows of data displayed the bar graph shown below is plotting data for all 70 rows. 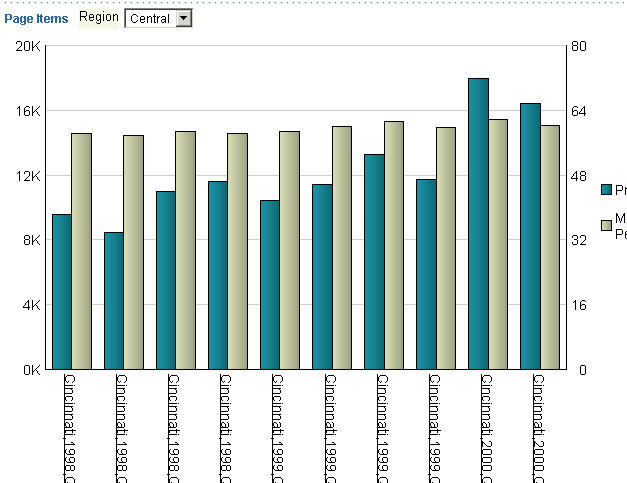 As you can see the graph looks crowded. I could change it to an area graph or a line graph to improve its appearance, or I could increase the plot area of the graph, but there is a third alternative. 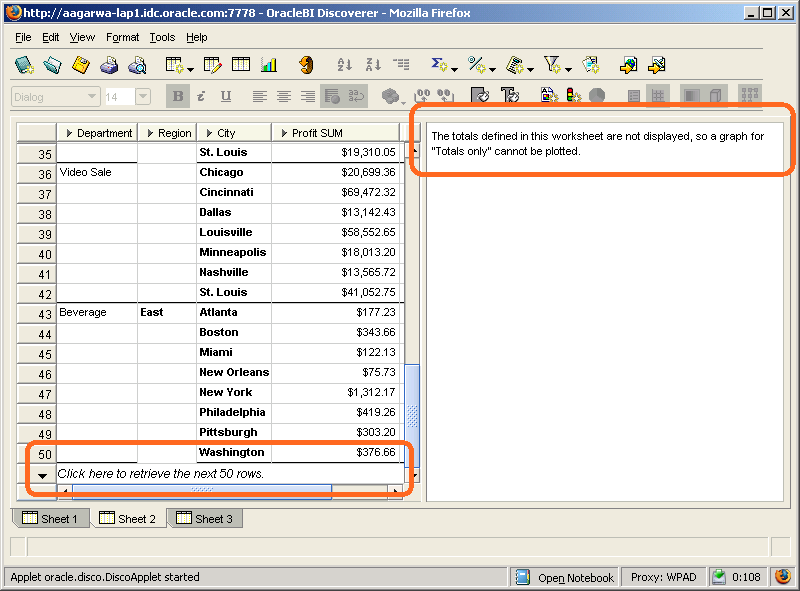 First, I want to reduce the number of rows of data I see in my table itself. 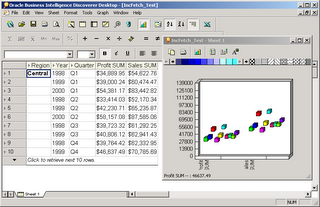 Since I have 10 quarters worth of data for every city, I have set the number of rows I want to see at a time to 10. The second, and more important change I make is this: expand the 'Tools' toolbar of the graph, and you will notice two radio group options. The first one, 'All data', is the default option. 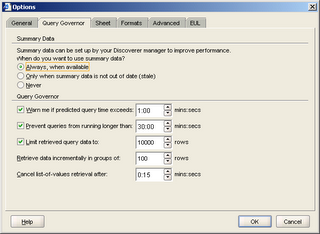 The second option, 'Displayed data', is what I am interested in. I check this option and click 'Go'. The graph now plots data only for those rows that are actually displayed in the table in Viewer, not for all the data. 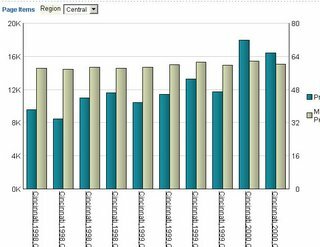 If I were to page to the next 10 rows of data in the table above, the subset of data graphed changes from 'Chicago' to 'Cincinnati'. A brief footnote: sometime in July 2003 our Viewer expert had prototyped this and asked for inputs on the suitablity of including this in the final product. My feedback was, "I think it is great!"